Kicking off this year’s Christmas in July Gift Guide is one of my long time favorites – Discovery Toys! Discovery Toys has been encouraging fun learning play for more than 35 years. Their toys are as fun to play with as they are educational. Children learn best through play, so Discovery Toys offers toys ages birth to 8 years old that engage all three learning styles to teach fundamental skills that children need. Independent Discovery Toys Educational Consultant Sharon Loper sent me the Measure Up Cups to be featured in this year’s gift guide. I love this product because even though Discovery Toys is mainly for young children – but these cups have all kinds of uses for older kids too! I even used them the other day to measure out some dry ingredients for a recipe I was making. 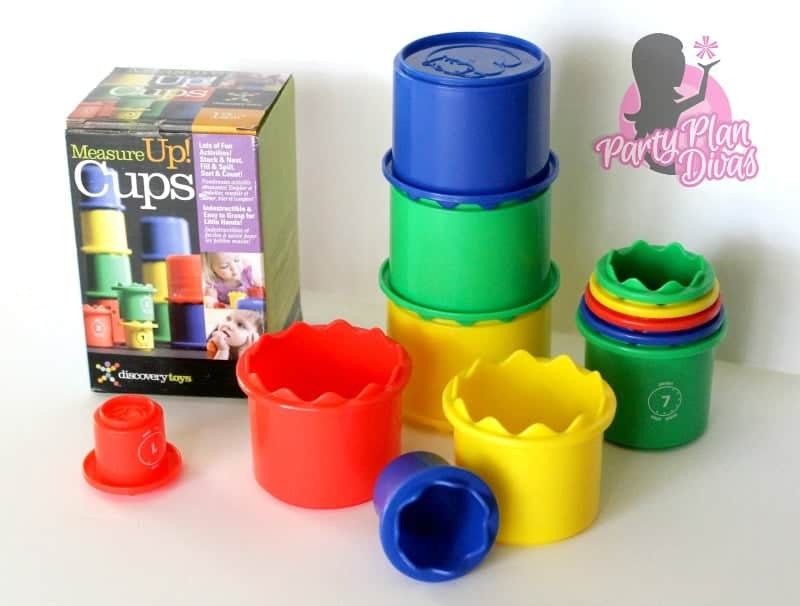 The Measure Up Cups is a set of 12 brightly colored cups that allow your little one to scoop, dump, fill, nest, stack, stamp and even knock over for hours of fun! These volumetrically correct sequentially numbered cups introduce important preschool concepts related to volume, size, time, color and measurement. Discovery Toys also proudly supports Toys for Tots, donating thousands of toys to the program all year long. They also have specific toys geared towards children with autism and other special needs to help assist with any of their developmental challenges. Discovery Toys not only has an amazing product line, but also a great hostess program and generous compensation plan. As a customer, hostess, or consultant you can be confident that you have the best quality products at the best prices to help the children in your life develop a love of learning through fun playtime toys.